For sale, baby shoes, never worn: Hemingway probably did not write the famous six-word story. Did Hemingway Really Write His Famous Six-Word Story? Hemingway’s authorship of the classified ad-inspired short-short story is frequently described as a “literary legend,” which, to be fair, is a perfectly accurate way of putting it. Snopes looked into the legend a few years ago, and decided that its basis in fact was “undetermined.” But after reading O’Toole’s more thorough investigation, it’s very hard to believe that Hemingway had anything to do with the tale. 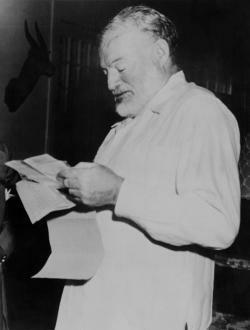 Ernest Hemingway died in 1961, and the earliest published evidence known to QI connecting him to this tale appeared in 1991. The author Peter Miller included a version of the anecdote in his book Get Published! Get Produced! : A Literary Agent’s Tips on How to Sell Your Writing. Miller stated that he was told the tale by a “well-established newspaper syndicator” circa 1974. There was an ad in the Brooklyn “Home Talk” which read, “Baby carriage for sale, never used.” Wouldn’t that make a wonderful plot for the movies? That note was reprinted in multiple newspapers. A few months later, LIFE published the following squib, citing the Louisville Carrier-Journal. The great American dramatist will be the man or woman who can write a one-act play as poignant as a seven-word want ad which the Houston Post discovers: For Sale, a baby carriage; never used. Is that 1917 article, written by one William R. Kane, connected with the Hemingway legend as well? Perhaps. In any case, Kane seems a more likely “author” of the story than Hemingway is. And Moulton probably deserves the most credit, pending further evidence. Well, either Moulton or Jerry from Brooklyn. Or whoever was selling that baby carriage in 1921.